In the first quarter of this year, the economy grew at an annual rate of 0.1 percent. Over the last four years, the economy grew at an average of 2.25 percent. In all, this has been one of the slowest recoveries on record. 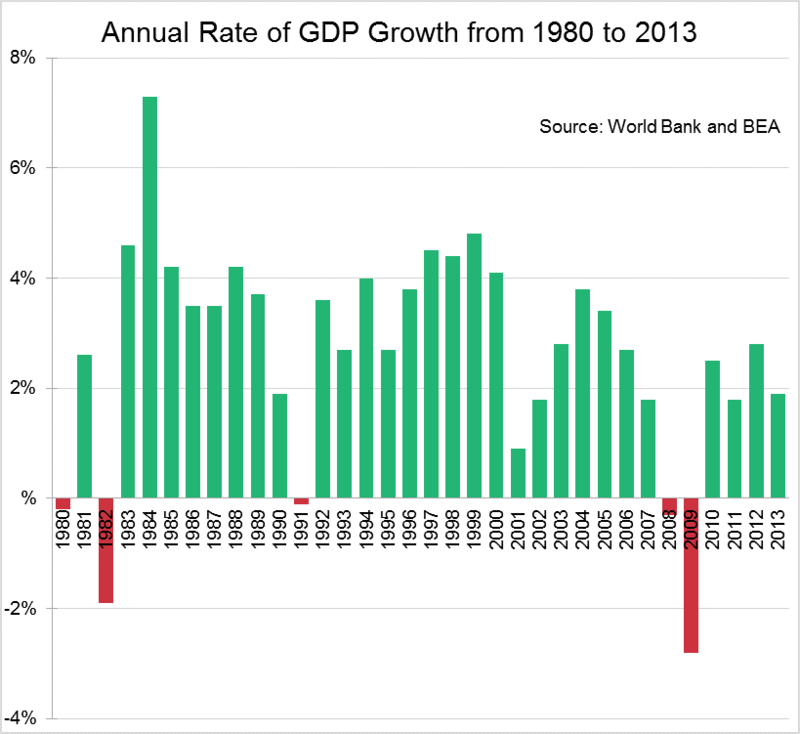 Furthermore, if we compare the post-recession four-year average of 2.25 percent to average growth of 3.15 percent in the 1980s and 3.23 percent growth in the 1990s, or even the 2.66 percent from the pre-recession years in the 2000s, the picture does not look good. But the good news is that it doesn’t have to stay this way. Comprehensive tax reform would significantly grow the economy. If we were to fundamentally overhaul our tax system and implement a neutral tax system (i.e. a tax code that doesn’t discourage saving and investment and only taxes each dollar once), we would see big boosts to the size of the capital stock (i.e. the tools we use to work, such as equipment and factories), wage rates, and the overall size of the economy. Completely overhauling the tax code and instituting a consumption tax that raises an equal amount of revenue to our current tax system would only require a tax rate of around 14 percent. This type system would tax each dollar once and treat saving and consumption neutrally. In the long run, this type of reform would increase the size of the capital stock by 32.77 percent, raise wages by 8.57 percent and increase GDP by 11.7 percent. A dynamically revenue neutral plan would require an 11.5 percent tax rate and increase the size of the capital stock by over 40 percent, raise wages by nearly 10 percent, and increase the size of the economy by 14.82 percent. An economy that is 11.7 percent larger after ten years would be the equivalent of about 1.2 percent in additional GDP growth each year. That means that instead of growing at an average rate of 2.25 percent a year, we grow at an average rate of 3.45 percent, which exceeds the annual growth rate of the 1980s and the 1990s. Even though comprehensive tax reform could have a major impact on jobs, wages, and the size of the economy, even more minor improvements to the federal tax code could make a difference. Extending bonus expensing on a permanent basis would increase the size of the economy by over 1 percent, or add 0.1 percent to the growth rate each year. Additionally, it would increase size of the capital stock by about 3 percent and add 212,000 jobs. Due to the growth, it would also increase annual federal revenues by $23 billion over the long run. 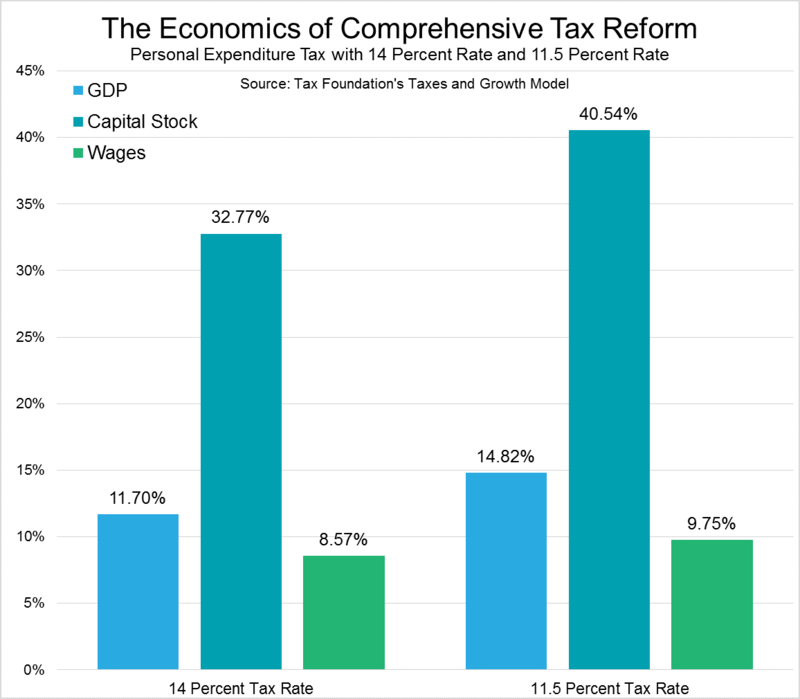 Going one step further and moving towards full expensing would have an even greater effect on the economy, increasing the capital stock by over 15 percent, wages by over 4 percent, and the economy by 5.21 percent, or about 0.5 percent more growth each year. We have the opportunity to escape perpetually slow economic growth, but we can’t do it with our current tax code. Any pro-growth tax changes, whether it’s through comprehensive tax reform or quality reforms on the margin, would be a positive for jobs, wages, and the economy as a whole.